I figure odds are the interview was conducted in English, so why not translate it back into English? It never works exactly, but I find Roman Golobart an interesting-enough figure to try to pull it off anyhow. FC newcomer Roman Golobart (21) speaks with BILD about his nickname, his guitar sills, and his beard, which he suddenly shaved after the derby. BILD: Why is the beard gone? Golobart: “I hope that I can always manage myself in such situations. I think one should control oneself. I’m honestly not sure that’s legal in wrestling, either. Even the fake kind! BILD: Tony Ujah called you the FC-Gladiator. Fitting? BILD: and your other nicknames? Golobart: “You already know them, right? Let’s just say this: There were some among them that you’d rather not print in a newspaper. And what my girlfriends named me, I’ll also not tell. BILD: Then tell us, what kind of a gladiator is Golobart really? BILD: Okay, then we will tell it: You can play the guitar really well. Golobart: “True. But I think I play football better. I’ve written a few songs, but not yet enough for an album. BILD: Have you tried your talents out in the clubhouse? Golobart: “Even were I a rock star, the clubhouse would be the last place that would happen. BILD: Additionally, you like to do yoga. BILD: Did your father, a former player for Espanyol Barcelona, say anything to you before the derby? Best image I could find of Joan Golobart Serra. Looks like a footballer to me! BILD: And how was it? Golobart: “The derby was the greatest thing I’ve ever experienced, and I was at an English FA-Cup final. What I experienced here in the derby was just unbelievably impressive. 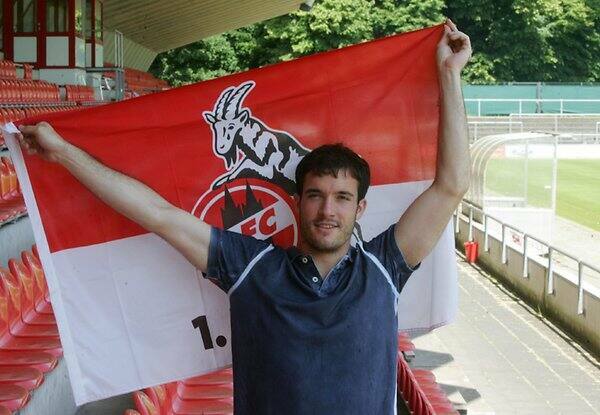 Be the first to comment on "Effzeh auf Englisch: Roman Golobart Interview with BILD"